Much-decorated soldier was posthumously promoted to sergeant first class. WASHINGTON (CNN) -- An Army staff sergeant will posthumously receive the Medal of Honor after he sacrificed his own life in an effort to save another soldier in Afghanistan, the White House said Friday. By acts of "immeasurable courage," Staff Sgt. 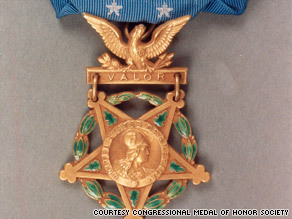 Jared Monti earned the Medal of Honor, the White House said. Staff Sgt. Jared Monti will receive the medal, the nation's highest military honor, on September 17 for his actions in combat, the White House said in a statement. His parents, Paul and Janet Monti, "will join the president at the White House to commemorate their son's example of selfless service and sacrifice." Monti, of Raynham, Massachusetts, died June 21, 2006, while deployed with the 10th Mountain Division, according to a Web site set up by family and friends to announce a scholarship in his honor. He was 31 when he died. Monti's reconnaissance team occupied a surveillance position when they were attacked near Gowardesh, Afghanistan, and he was killed by enemy fire, the Web site says. The White House statement said Monti "displayed immeasurable courage and uncommon valor -- eventually sacrificing his own life in an effort to save his comrade," but did not provide details of his actions. Monti's military decorations already included the Bronze Star, Purple Heart, five Army Commendation Medals, four Army Achievement Medals, three Good Conduct Medals and three National Defense Service Medals, the White House statement said. He is survived by his parents, his sister and brother and a niece. Monti was posthumously promoted to sergeant first class. The Medal of Honor is awarded to U.S. soldiers who distinguish themselves with "gallantry above and beyond the call of duty," the White House said. "The meritorious conduct must involve great personal bravery or self-sacrifice so conspicuous as to clearly distinguish the individual above his or her comrades and must have involved risk of life."